On 26 September The BEARR Trust was delighted to welcome Lilia Shevtsova of the Carnegie Moscow Center. She gave a talk on “Politics and society in Russia today” at the conference centre at BEARR’s HQ. Lilia was introduced by Robert Brinkley, Chairman of the BEARR Trust. She answered wide-ranging questions after her talk, a summary of which appears below. Introducing her talk, Lilia said that Russia today is in need of compassion, empathy, and understanding for the paradoxes it is living through. A new drama is unfolding in Russia. It could become a new tragedy in Russia’s history. Many people in Russia, not only liberals who are not part of the current system of power, but representatives of other political and ideological groups, including some close to the official establishment, are aware that the current system is not sustainable. The system is not capable of delivering progress, economic development and stability. But as has been the case since the sixteenth century, civil society has not been able to build a political movement capable of replacing the existing system. There is, however, no “systemic alternative” that would have broader support within society. Meanwhile the West, which has its own problems, prefers Russia to keep quiet and not interfere, and shows no interest in creating a benevolent external environment for change in Russia. Painting in what she described as the brushstrokes within this broad canvas, Lilia referred to Toynbee’s “suicidal statecraft” in which the system begins to undermine itself, with the ultimate potential to destroy itself. However, the existing system in Russia still has potential to survive, she thought, using corruption as its mechanism of survival. The culture of corruption throughout society keeps people generally content, but cracks are beginning to show. It could be a case of “a Titanic looking for its iceberg”. The opposition has been under state pressure and political parties are mere imitations of parties. Thus the people are pushed on to the streets. The law is becoming increasingly repressive, as is typical of such systems. One new repressive law has followed another over the past summer. One of them requires NGOs which receive foreign funding to register as “foreign agents” (which in Russian means nothing other than spy). The law on extremism has been strengthened, and another redefines state treason. Rather than keep their heads down, however, people, especially young people, are being radicalised. The young do not have any Soviet genes and are not afraid. Up to thirty thousand are ready to march in the streets, representing the core of the protest wave (in 1917 it took only 5,000 to bring about a revolution). The system keeps looking for enemies, a traditional reaction. It is not able to modernise, which can only lead to decay, but a new Russia is nevertheless emerging. Public opinion surveys show that 68% of the population do not believe that the interests of the authorities coincide with those of Russia. If even 10% of the population take to the streets in protest, it will be the first time in Russia that the “elite” classes, including the opposition and the intelligentsia, while not yet ready to come up with an alternative, could reject the system and would be willing to support new rules of the game. The BEARR Trust is a charity dedicated to working with NGOs in Russia and other countries formerly part of the Soviet Union to help develop the third sector in the region, especially in the field of health and social welfare, and thus promote the establishment of democratic and stable societies. This was a BEARR Trust fund-raising event, and guests were invited to make an advance donation of £20 per person. All proceeds will go towards BEARR’s work to support health and welfare and to strengthen civil society. 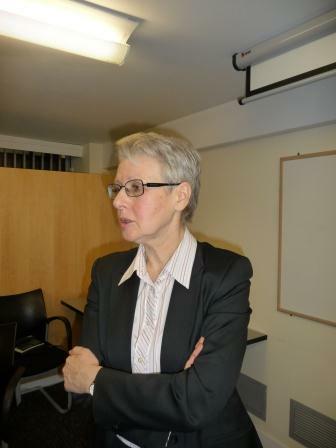 Lilia Shevtsova chairs the Russian Domestic Politics and Political Institutions Program at the Carnegie Moscow Center, dividing her time between Carnegie’s offices in Washington, DC and Moscow. She has been with Carnegie since 1995. Shevtsova was a professor of political science at the Moscow State Institute of International Relations, deputy director of the Institute for International Economic and Political Studies of the Russian Academy of Sciences, and director of the Center of Political Studies in Moscow. She has been a visiting professor at the University of California at Berkeley, Cornell University, and Georgetown University, and a fellow at the Woodrow Wilson International Center for Scholars. Shevtsova was also a member of the Executive Council of the International Institute for Strategic Studies, founding chair of the Davos World Economic Forum’s Global Agenda Council on the Future of Russia, and member of the Global Agenda Council on Terrorism and Weapons of Mass Destruction. Shevtsova is a member of the editorial board for the journals American Interest, Pro et Contra, Demokratizatsiya, and the Journal of Democracy. She is a participant in the Davos World Economic Forum’s ongoing program “Global Redesign Initiative,” senior research associate at the Russian Academy of Sciences’ Institute of Economics, and associate fellow at the Royal Institute of International Affairs (Chatham House). She is also a member of the board for the Institute for Human Sciences at Boston University, the Women in International Security international association, the Liberal Mission Foundation, and the New Eurasia Foundation. Shevtsova is the author and editor of fifteen books, including: Putin’s Russia (revised and expanded edition; Carnegie Endowment, 2005), Russia—Lost in Transition (Carnegie Endowment, 2007), Lonely Power (Carnegie Moscow Center and ROSSPEN, 2010; English edition—Carnegie Endowment, 2010), and Change or Decay with Andrew Wood (Carnegie Endowment, 2011).